But first, my first ever Youtube video! Watch it to understand this entry. 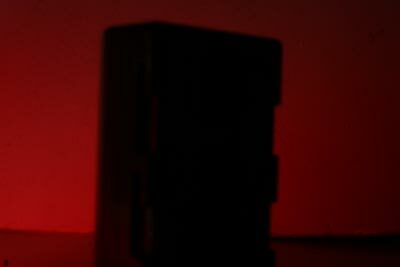 This is the mysterious red box, next to a film canister for size comparison. Okay, so there’s no more mystery. 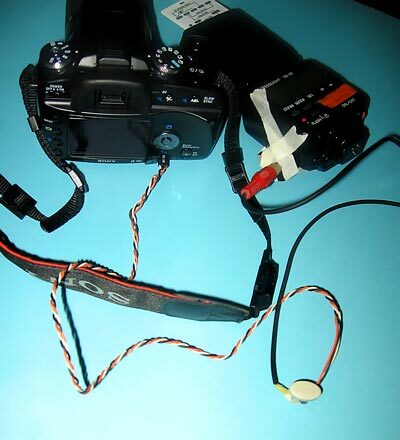 A, B and C are the pins on the Sony Alpha A100‘s remote shutter release. Shorting A and B activates auto-focus, and shorting A, B and C together activates the shutter. 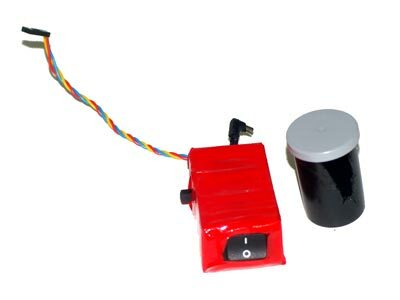 There are two switches; the left-side one activates auto-focus while the right-side one, a single-pole-double-throw switch, closes B and C as well as the PC Sync connection to the Nikon Speedlight SB-28, thus causing the flash to fire! 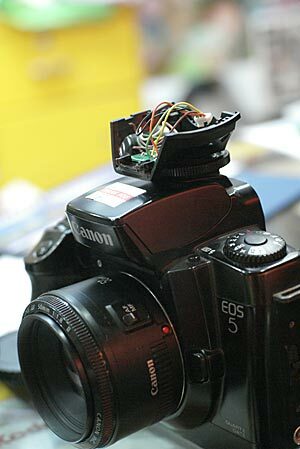 Thus, I have made a remote shutter cable release and a wired flash trigger! But first, a visit to the first-generation version. 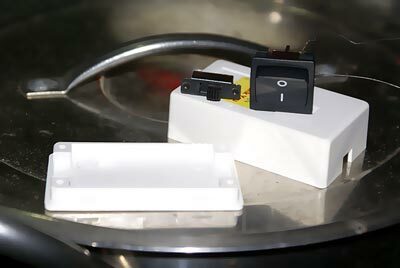 From left, a single-pole-double-throw toggle switch taken from a Turbo switch of a 486-class computer, cellotaped wires (I didn’t have a soldering iron then) and a rudimentary way to connect to the PC Sync Connector of the Nikon SB-28 using the back of a female RCA socket and a bent pin. But this is really too much effort, if you can find a PC Sync Connector cable! 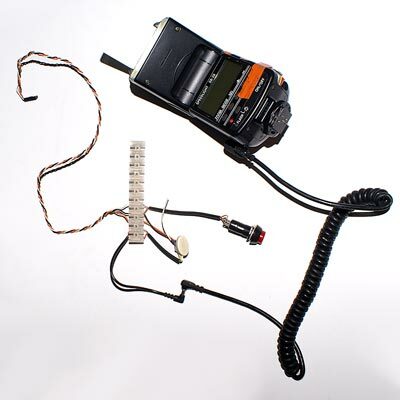 Generation 1 remote shutter cable release/wired flash trigger. It did not have an auto-focus switch, so I had to half-press the camera before pressing the shutter/flash switch. The one on the right has a difference; the flash is set to strobe mode, with 2 strobes at 7 Hertz, 1/8th power. I found that 7 Hertz was the fastest that the flash could strobe to be captured by the camera. Picking a faster strobe speed like 8, 9 or 10 Hertz meant dark shots as well. The only downside to strobe flash is that it would be at lower power and requires longer exposures. Generation 2, with a connector. No more cellotape! Also, featuring an auto-focus switch! 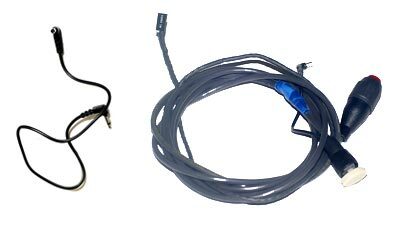 Left: A PC Sync Connector cable to mini audio jack (which was cannibalized in Generation 2.) Right: Generation 3, sealed up thanks to my friend in the engineering department of the office. Unfortunately he swapped one connection, so it doesn’t work as it should, and was too busy to redo it. 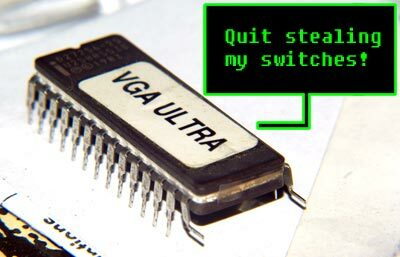 VGA Ultra gives me a stern warning. You can get your own 3-pin motherboard connector from a electronics parts shop. 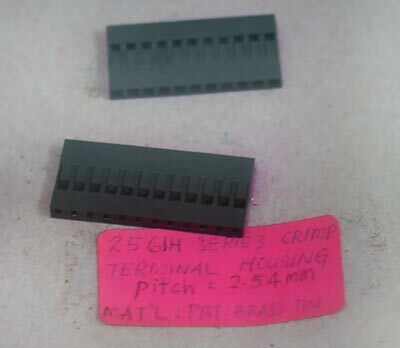 This reads 2561H Series Crimp Terminal Housing (pitch: 2.54mm). Get the 3-pin one for the Sony A100, and a standard mini audio jack for a Canon dSLR. Generation 4; I finally got a project box and two new switches. The previous ones malfunctioned after a while. I had to tape it up because the project box was too small and would not seal completely. I could not fit the big switch in fully! The same shot in the video. This is dedicated to all the people who say things are impossible. More hacks to come! 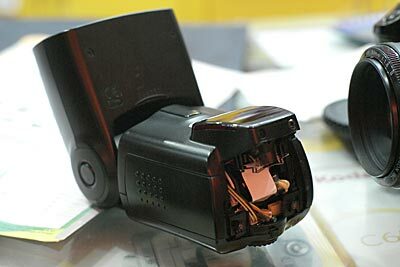 Also, read the good reasons why Minolta changed their flash mount. To avoid this! This is a living dead example. Woe is the poor beheaded Canon Speedlite 580EX flash. Often with big flashes, your flash may tilt forwards and crash into things while you walk sideways in cramped spaces. (Or worse, your flash makes your camera do an obscene nosedive; the Nikon SB-28 did that a lot to my Olympus OM-2000.) Taking it off is hard with the old hotshoe mount, having to twirl the ring to release. Minolta/Sony made it damn easy; just press a button to release! This entry was posted in Geek, Pictures on March 12, 2007 by 2konbla.